If you’re not a culinary expert, this might seem like voodoo magic. It’s not! In this article, we’ll go over all the basics of meat tenderizing – how it works, why you should do it, and why you don’t always do it with expensive steaks. We’ll also talk about various home tenderizers, giving you lots of inexpensive, durable options to choose from for your kitchen at home. Let’s get started! 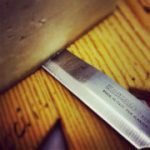 Manual Meat Tenderizers – What’s All The Fuss About? Ever chew on a really tough piece of beef? The experience of trying to eat a bit of gristle or even just a really inexpensive cut of meat that hasn’t been cooked correctly is not pleasant. These sturdy, chewy pieces will resist your teeth and do their best to stay whole – and they’ll often succeed. The result is a gross experience that can ruin an otherwise nice dinner, especially if It happens more than once during your meal. While tenderizing won’t fix gristle, it will go a long way towards making a cheaper cut of meat more palatable. See, meat is made up of lots of stuff, but the thing we’re concerned with here are fibers. 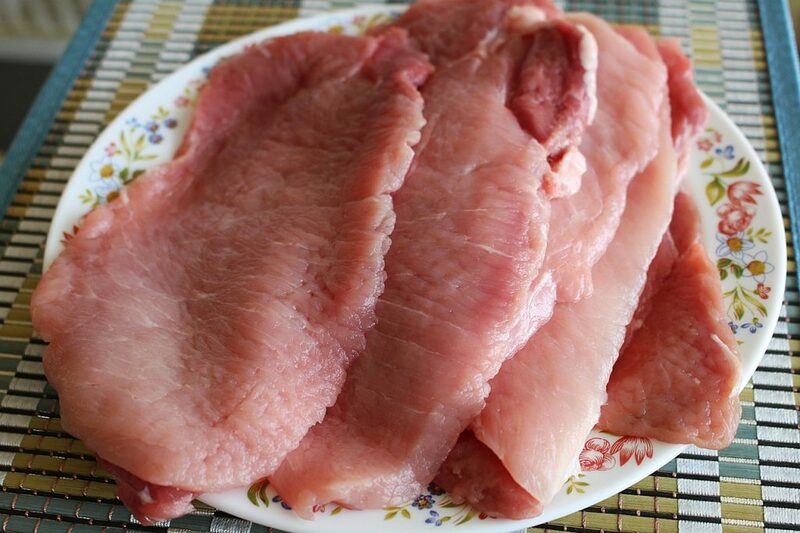 When you tenderize meat mechanically, you physically break up these fibers by literally breaking them apart. Stainless steel meat tenderizers pound and squeeze your meat so that these fibers are short and easy to chew by the time the meat hits your mouth. There’s another more subtle upside to tenderizing meat, and that has to do with the form factor of the meat itself. 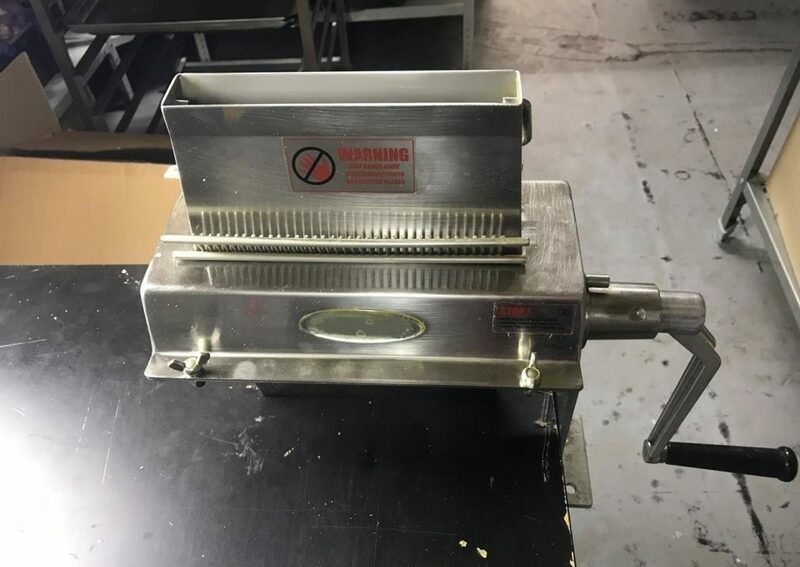 Most home meat tenderizer machines flatten the heck out of a cut of meat while they work. This increases the surface area of your meat and allows it to cook faster and more evenly. Cooking tends to improve texture, as long as you’re using an appropriate recipe, so this means that there’s a much higher chance that the center of your meat winds up nice and tender. So why don’t we tenderize all of the meat we cook? The short answer is “because it looks bad.” Tenderized meat doesn’t have the same sort of nice visual appeal as a well-presented pricey steak. Instead, it looks somewhat flat and misshapen. The texture added by the tenderizer doesn’t help, either. The other reason is that expensive cuts of meat are already tender. While helping the inside of a cube steak cook faster is good, you usually don’t want to serve your porterhouse steak well done. Instead, you want a nice thick cut that allows you to have a crispy outside without overcooking the inside. If the steak is pounded thin, this process gets pretty hard. Mechanical tenderization isn’t the only way to improve the texture of meat. Other techniques, like slow cooking, marinating with acid, and even fermenting can break down the physical structure of meat as well. You can use these techniques in tandem to ensure that your meat comes out flawlessly. Try tenderizing a cut of your favorite meat, marinating it, and then cooking it slow and low to get something truly tender and wonderful. This classic meat tenderizer is one of the most popular and long-lasting crank tenderizers on the market. The Sportsman might not be the machine that started it all, but it’s definitely the one that people tend to talk about when it comes to cast iron meat tenderizers. Before we progress, it’s important to note that Sportsman doesn’t make these out of cast iron anymore. Instead, they use food-safe plastic rollers and an aluminum body. This makes the machine lighter, cheaper, easier to crank, and easier on your counters. On the other hand, it might make it slightly less durable – plastic is certainly much easier to break than cast iron. If you really want cast iron, you can sometimes find an old Sportsman that’s still made of cast iron if you look hard enough. Alternately, you can simply purchase the cast iron tenderizer below from a different brand. In order to use this device, you attach it to a solid surface (like a counter) using a built-in clamp at the bottom. A sturdy aluminum bracket lifts the two rollers above your work surface. You feed your meat in slowly through a plastic hand-guard, into the rollers, and then crank away. As you turn the rollers, they’ll push your meat out to the other side. During its passage through the machine, however, your meat will be thoroughly squeezed between the rollers, breaking down the fibers inside of it and making everything nice and tender. 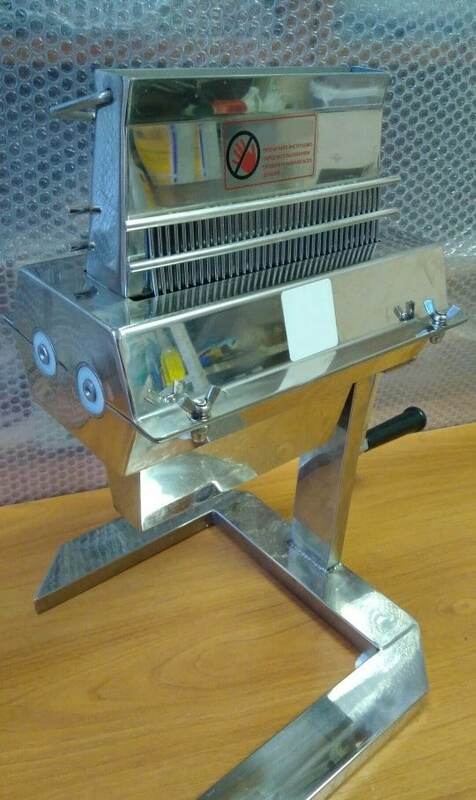 The rollers on this machine (and most meat tenderizers) have small divots in them that give your meat a traditional “cubed” appearance. Again, this might look a bit funky to your guests, but you’ll definitely enjoy how incredible your thin, tenderized meat tastes despite the odd bumps. As far as size goes, this machine is built to handle cuts of meat that are up to ½” thick. You can technically tenderize meat that’s far thicker than that (up to 1”), but you’ll have to use a lot of force when you crank the rollers, and you risk causing a bit of a jam. It’s easy to reverse any jams – simply crank backwards – but you should probably stick to ½” cuts if possible. As you might expect, this hand-crank meat tenderizer does require a bit of physical force from you, even on fairly thin cuts of meat. It’s definitely not a huge amount, nor does it require this force for a long period of time, but you should expect to use a moderate level of effort while you use this machine. So what can you make with this? Any cheap sort of steak or “steak” dish is massively improved by proper tenderization. Chicken fried steak is a classic favorite, as is cube steak. This machine lets you turn pretty much any cheap cut into thin, tender steaks that you can quickly sear over high heat. The results are quite impressive. With a bit of seasoning and maybe a marinade, you can impress even the pickiest eaters with some incredibly inexpensive dishes. There are, of course, some downsides to this machine. First, the rollers aren’t adjustable at all. The ½” thickness I described earlier can’t be adjusted. Second, the clamp at the bottom is more suited for a workbench than a fancy kitchen. Expect to have a mark of some sort wherever you use this device. Finally, while cleaning this device isn’t difficult, it’s not as easy as it could be. The rollers don’t easily disassemble, so you have to throw the whole thing in the sink. Overall, the Sportsman Hand Crank Meat Tenderizer / Cuber is an excellent purchase. It’s incredibly affordable and delivers tremendous power in terms of cubing and tenderizing meat (they’re the same thing – cubing refers to cube steaks, which are a tenderized cut of beef). While other options exist, this Sportsman is one of the most popular and well-loved tenderizers around. It fits right at home in just about any kitchen. If you’re after something a bit more heavy duty, this large Weston tenderizer might be up your alley. While it’s still not an adjustable meat tenderizer, Weston has outfitted this burly unit with sharp stainless steel combs that penetrate your meat and slice the tough, pesky fibers within. It might not flatten things out quite as much as the Sportsman, but it’s significantly faster. For anyone who wants to quickly tenderize large quantities of meat, this Weston is a brilliant choice. So why is the Weston faster? The simple answer is that it works differently. 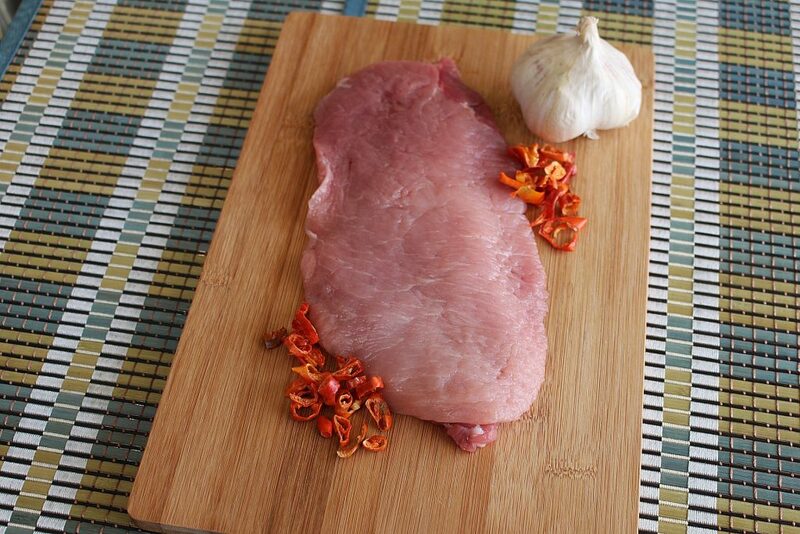 Instead of squeezing your meat out, it penetrates it with a number of blades. This physically breaks up fibers by simply slicing them inside the meat. Running your meat through the machine gives the blades plenty of time to penetrate and slice things up, even though it basically falls through at the speed of gravity. Some cooks like to turn their meat 90 degrees and run it through twice, but that’s hardly necessary for most cuts. 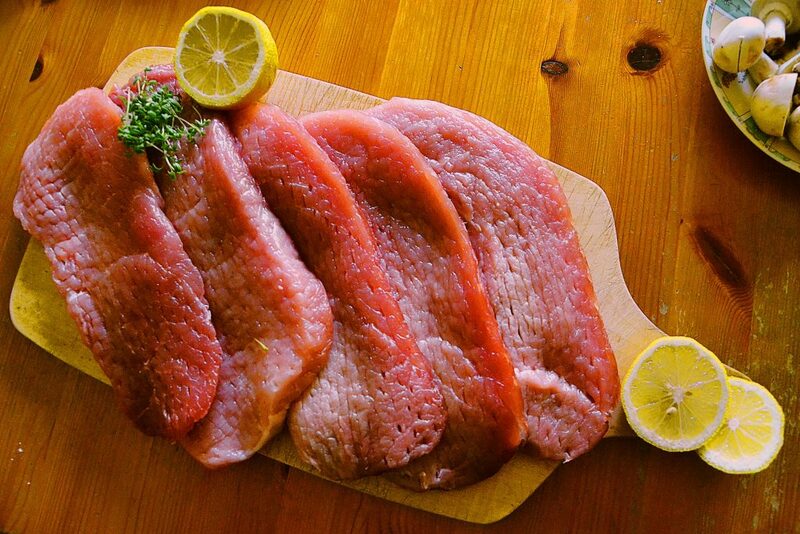 Even with this extra step, you’re looking at just a few seconds to tenderize each piece of prepared meat. If you’re cooking a lot (or simply processing a lot of meat for later), this means that you’ll safe a significant amount of time (and cranking effort) over the Sportsman. Cleanup is easier, too. Each of the all-metal parts inside this Weston comes out for easy cleanup, ensuring that you have access to every nook and cranny inside the machine. The rollers themselves are made with stainless steel, while the durable aluminum frame is light, portable, and fairly cheap. The Weston tenderizer might be a bit much for some kitchens, but if you think you’ll tenderize meat more than once or twice a week, it’s a nice upgrade over the Sportsman above. 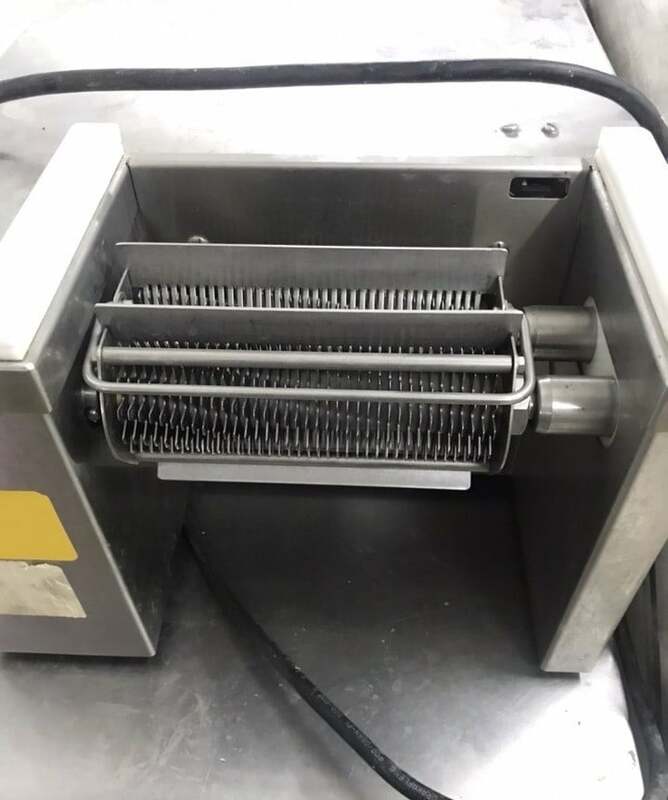 The speed at which it tenderizes meat is incredibly impressive, while the durable metal parts and easy cleanup ensure that you’ll be happy to own this machine for years to come. Even if you only break it out a couple times a year, you’ll still love the tender meat that it can process in seconds. Sportsman stopped making their tenderizers with good old cast iron a few years back, but this brand didn’t. This heavy meat tenderizer operates under the same principles as the Sportsman above. Instead of using plastic rollers and an aluminum frame, however, it’s made out of sturdy cast iron. There are both advantages and disadvantages to this. Cast iron can rust, for one, and it means that this machine can scratch up your countertops quite badly if you’re not careful. Additionally, there’s zero “play” in the rollers and the frame. The thick, heavy cast iron will resist bending and deforming at all costs. This means that you really, really can’t put meat that’s more than ½” thick through the rollers. If you’re careful, however, this metal meat tenderizer can last for years. The basic functionality is just the same as the Sportsman – the metal rollers squish and poke the meat, helping to break up tough fibers. Again, you’ll need a bit of pressure on the crank with thicker meat, and the clamp at the bottom can scratch up your countertop. Overall, though, it’s a brilliant product that makes preparing less expensive cuts of meat a breeze. Personally, I’m okay with the plastic-and-aluminum Sportsman – I find that cast iron is a mild pain to care for over a multi-year time span. If you’re okay with oiling your tenderizer, however, and you don’t mind the increased risk to your cupboards and counters, this iron meat tenderizer might be the right product for you. It’s not too expensive, it’s quite durable, and it does a great job of producing tender meat from cheap cuts. 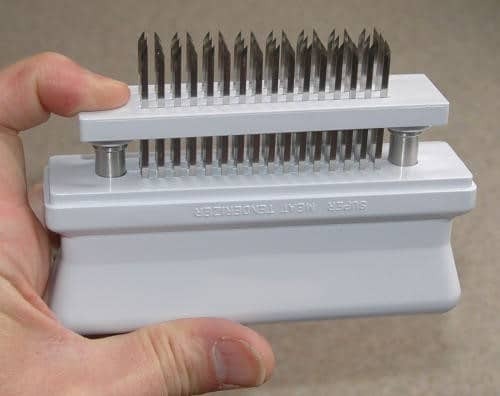 If you’re not down to crank, consider an alternate style of hand tenderizer – the needle tool. This gift set comes with two silly claws for “shredding meat” (admittedly, they’re fun to goof around with when you’re making pulled pork) and a tool that you can use to tenderize meat yourself in a jiffy. While it’s nowhere near as fast as the Weston above, it has the advantage of working with meat cuts of all shapes and sizes. Perhaps most importantly, this set is incredibly cheap, making it a perfect gift or add-on purchase on a budget. The tenderizing tool in this set works on a very simple principle. It’s basically just a bunch of needles that stick out of a handle. There’s a simple guard that prevents these needles from poking anything until you press down on a piece of meat. 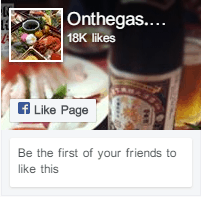 When you do that, the needles penetrate the meat and sever lots of fibers, increasing the overall tenderness. Moving this tool up and down over several large steaks (or other cuts) can take a minute or two. It’s not hugely arduous or tiresome, but it will really make you appreciate just how darn fast the Weston above is. The end result is quite similar, at least on a pass-by-pass basis. With the Weston, you’re likely to get bored and run the whole batch through two or three times before this hand tool has finished tenderizing the first big piece. Again, the results are pretty darn similar, just slower. This inexpensive tool is a nice thing to have in a drawer somewhere for when you’re tenderizing a small piece of meat and you don’t want to break out the big crank tenderizer. I think it’s a good fit for most kitchens. If you’re not up to buy two machines, however, and you can afford the Weston, I think it’s definitely the better buy. It’s faster, incredibly durable, and even more fun to use. Meat tenderizers turn unappetizing cuts of meat into delicious meals with the turn of a simple crank. Whether you’re getting a squeezing-roller style tenderizer like the Sportsman, a needle-style tenderizer like the Weston, or one of the other options above, you’ll be able to prepare meals like schnitzel, chicken fried steak, and other less expensive cuts of meat in a jiffy. Any crank-based tool will out speed the heck out of hammers and push-style needle tools, enabling you to spend less time on meal prep and more time leisurely enjoying your meal. Best of all, these crank tools are pretty cheap. The Weston might be somewhat pricey for some households, but the Sportsman should fit into most kitchens and budgets. You can tenderize more than just beef, too! While chicken fried steak and cube steak might seem pretty beefy, you can tenderize tough game meats like deer, poultry, pork, and more. Tenderizing a cut of meat might make it look a bit worse, but it’ll break up the tough fibers inside of the meat and make it much easier to chew. Experiment and see where your tenderizer takes you! On especially tough meats, combine your machine with a marinade and a slow cooking process to really break down the tough stuff inside your meat. You’ll produce something succulent and delicious that melts in your mouth.